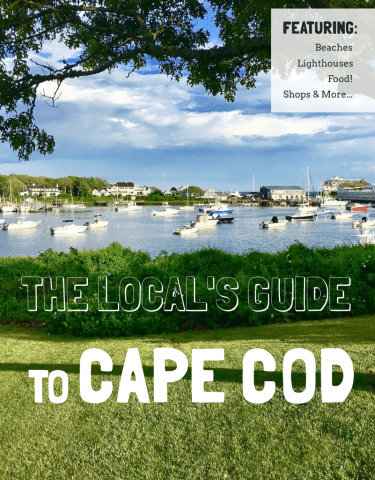 Lots of guests ask where to find the best Cape Cod ice cream so, we traveled around Mid and Lower-Cape to find out. 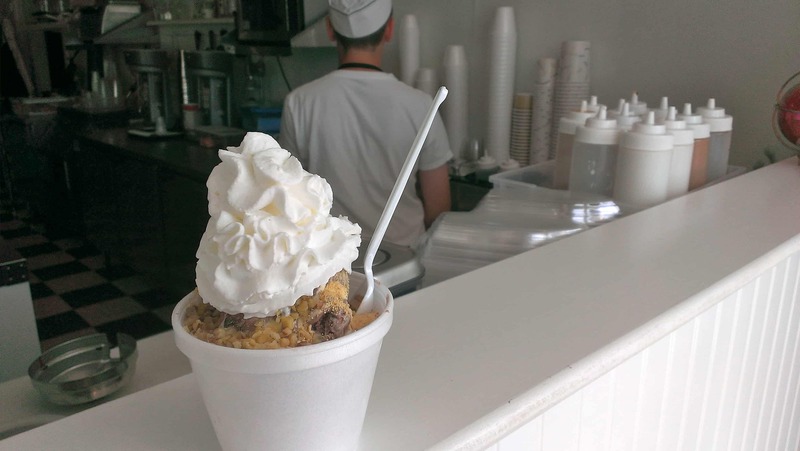 We went to 5 ice cream shops and have two Top 5 lists for you. Best tasting ice cream on Cape Cod and Best Ice Cream Parlor on Cape Cod (by the scene and atmosphere). Highlights for each are below. 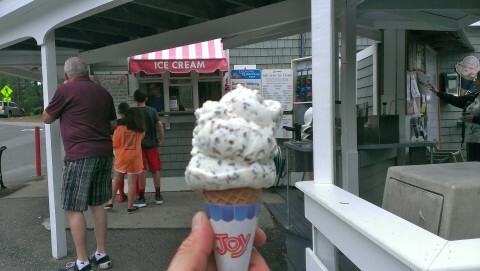 Nothing like Ice Cream outdoors on the Cape. Cobie’s in Brewster. Winner! Best Cape Cod Ice Cream (by taste). A sundae at Sundae School Ice Cream. Winner! 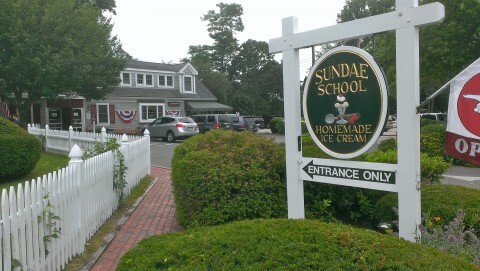 Sundae School Ice Cream for Best Cape Cod Ice Cream (by scene and atmosphere). The clear winner (for us) for best Cape Cod ice cream by taste and scene is Sundae School Ice Cream. 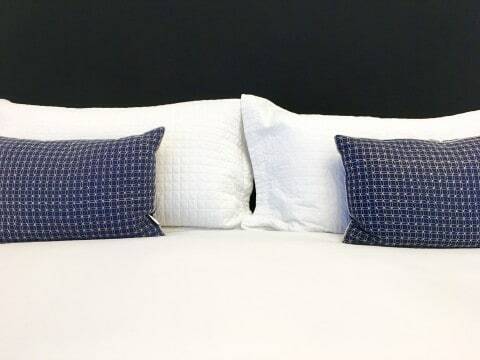 They have two locations near us at the Platinum Pebble Boutique Inn. The Dennisport location is profiled here and is a short walk from the Inn. 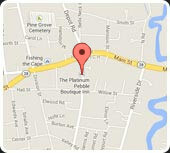 They also have a Harwichport location that is a short drive away. All of the ice cream we sampled was excellent, there was no bad ice cream. 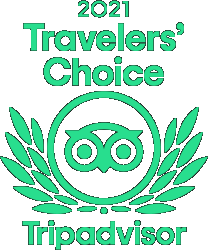 There were slight differences that we enjoyed that allowed us to actually rank them. 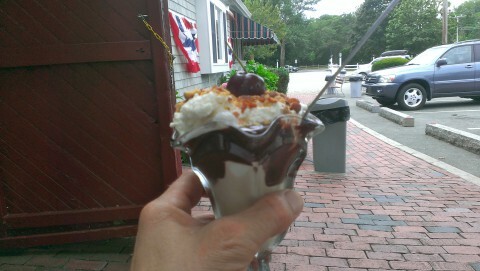 The whole scene came together to rank Sundae School Ice Cream at the top of the list for best Cape Cod ice cream. The interior of the classic Cape Cod style building is done really well with vintage signs and wood paneling. Outside is a great brick patio and picnic tables to relax in the cool air of a perfect Cape Cod afternoon. What a spot to watch the world go by. The front porch of the Cape Cod Creamery. 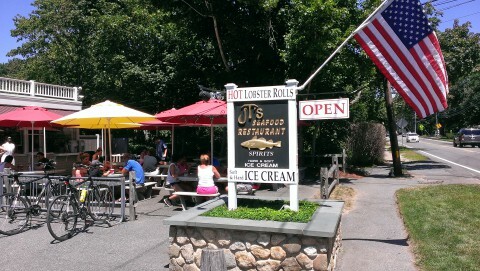 JT’s Seafood Restaurant and Cape Cod Creamery were a close 2nd and 3rd place. The winner for taste between the two was Cape Cod Creamery more because the portion was so large (in a good way) than there being much of a difference in taste. JT’s edged out Cape Cod Creamery to place 2nd for scene because they are located on a great section of Route 6A (The Old King’s Highway) that had enough going on to make it interesting but also very relaxed and comfortable. 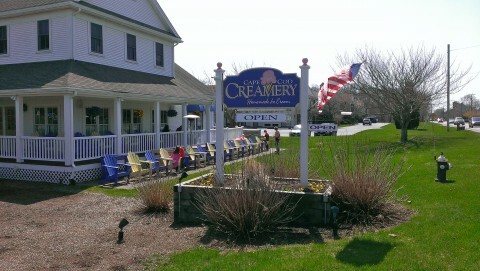 Cape Cod Creamery is in Yarmouth, just off Route 28…and there can be a lot of traffic on 28. Great laidback atmosphere at JT’s Seafood Restaurant. 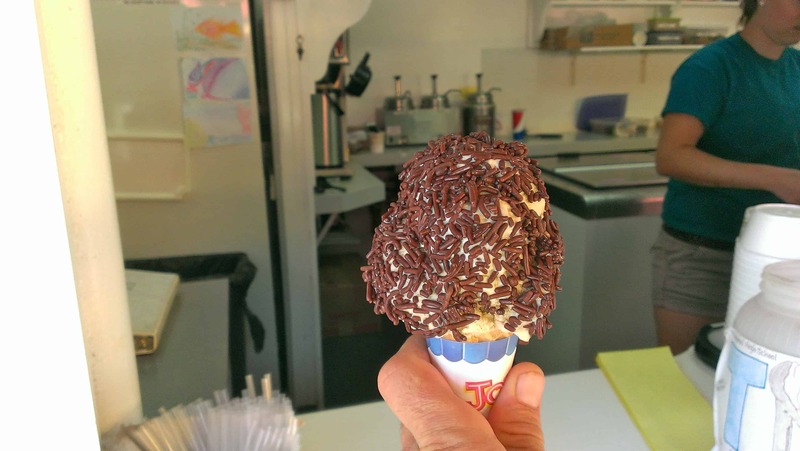 Almost every one of these ice cream parlors is an easy bike ride from the Platinum Pebble Boutique Inn. Come have a classic Cape Cod summer with us and enjoy go carts and ice cream in the best place on Earth. Coffee ice cream with chocolate sprinkles at JTs Seafood Restaurant. A sundae at Auntie’s Ice Cream Parlor.